Mother of pearl mosaic tile is also known as mother of pearl tile, mother of pearl mosaic, shell tile, seashell tile, shell mosaic tile, jewelry pearl tile, ect. It creates an air of nature, elegance and luxury with its 100% natural enduring luster. It is also eco-friendly and user-friendly, popularly used for projects in villas, hotels, luxury shops, beauty salons and so on. Its application is unlimited to the above places and you can also install it on kitchens as backsplashes, bathroom walls, living room walls, ceilings, column surfaces, fireplaces and more. Mother of pearl tile is with many stylish shapes, penny round,diamond, subway,rectangle,square,hexagon, ellipse,random,ect. Today, we will first introduce penny round seashell tile, and other shaped shell tiles in following articles. Penny tiles were originally used for floors, and now are a great choice for backsplashes, walls and even columns. The love for penny mosaic tiles may be never-ending. And penny round mother of pearl tiles become more and more popular. Usually, they can add delicate femininity to traditional bathrooms, or create captivating and sumptuous spaces. Handmade penny round mother of pearl mosaics are naturally organic and have pearlescent luster. They are very durable and easy to install on kitchens, bathrooms and other areas in both dry and wet places. They are perfect for bathroom walls, backsplashes, accent walls, fireplace surrounds,ect. Penny round pearl shell tiles can add a sheen and lasting exquisiteness in any spaces. 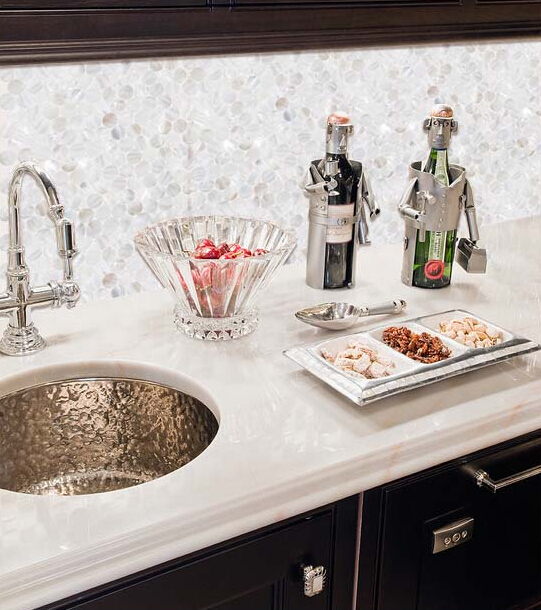 Your tips are really helpful in selecting the best Mosaic Tile for kitchen & bathroom. Are you looking for Best Kitchen Flooring and Installation Services, visit cancork.com.